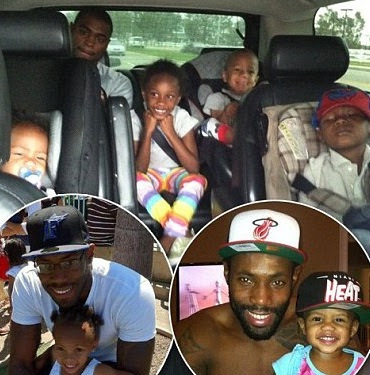 As he celebrates his 28th birthday today New York Jets cornerback, Antonio Cromartie, has another reason to raise a glass – he now fathers 10 children. The football star recently had his second child with his wife to add to his brood of nine children from a total of eight women across the country. Cromartie and his wife Terricka have named their new son, Jagger, who will join his sister Jurzie, as well as nine half-siblings. The newborn is the fourth child to the household in New Jersey, which consists of Jurzie, T.J - Cromartie's first son, and a child from his wife's previous relationship. If you include Cromartie's step-child the sports star has enough children to field a football team - where each team has 11 players on the field at any one time. Cromartie, who signed a four-year, $32 million contract with the Jets last fall, has to pay more than $3,500 in child maintenance each month to six of the women he has fathered children with. Last March the Jets had to pay the player an $500,000 advance so that he could pay outstanding child support. And now the ex-girlfriends, who Cromartie has fathered children with, are hoping to cash in with a new reality TV programme about their extensive brood. A TV production company has expressed interest in the idea but Cromartie is not allowing it to go ahead and has blocked any filming of his children. Nevertheless the women – from California, Texas, Florida, Georgia, North Carolina and New Jersey – have come together as apparent friends and, no doubt, in hope that the TV project will work. Ryan Ross, who works in a hotel in Los Angeles, is the mother of Cromartie’s fifth child, son Tyler Jae, 4. They dated for about six months after meeting in a nightclub. Ross is keen for the show to go ahead: ‘Our kids need to know who their siblings are. It’s bigger than our past with Antonio. It’s about our children,’ she told the New York Post. And she described the relationship between the other mothers as a ‘close tight-knit friendship’ where they understand exactly what each is going through and can 'vent' to one another. Former beauty queen Rhonda Patterson, who has a three-year-old daughter called London with Cromartie, wrote a book about her relationship with the footballer. In the memoir, Love, Intercepted, Patterson described how Cromartie cancelled their wedding a week before it was scheduled and ended their relationship when she was six-months pregnant. Shortly after dumping Patterson the footballer wed his current wife, Terricka Cason, who starred in Candy Girls – a reality TV show about scouting models. Cromartie is step-father to her child from a former relationship. The Jets cornerback also has custody of his first child, Alonzo, now 7, who he had with Rosemita Pierre. Pierre told the New York Post that the footballer star defies a court order that allows her to speak to her son three times a week. 'He’s supposedly a role model, but he’s not doing what he should be doing as a father, or as a man,' she told the paper.